Many men today avoid the abrasive, punchy, slap-it-all-over types of aftershave from the 1960s. They now opt for the gentler version of aftershaves, like an aftershave balm, lotion, cream or splash. Those types of aftershave tend to be more suited to every skin type and have moisturizing benefits. They usually serve as the gateway to men’s skincare for a lot of us who are completely new to that industry. In addition, aftershave heals your skin in terms of taking care of razor cuts, burns and ingrown hairs. The great thing is that there are many aftershaves for different skin types. We have to highlight that a quality razor, the best shaving cream or soap, a great shaving brush and the willingness to use all those components are essential to achieve the smoothest and most comfortable shave possible. OK, let’s get to it. Here are the 5 best aftershaves for men. But first, we have to give you the deets on aftershave. My Favorite Aftershaves in a Short List! If you’re short on time, here’s a quick recap of our favorites. Got 5 minutes? Keep reading to learn about what makes for a good aftershave. Men of all ages aspire to get tender post-shave skin. If you want that feel, you should try an aftershave. Aftershave does more important things than making you smell good—you are getting it because it is good for your face. It can help to prevent infections that can result from cuts and nicks from shaving because aftershaves contain antiseptics. They also have moisturizers that soften and cool your skin after the friction of a shave. Like all other markets, the aftershave market has both high quality and low quality products. We will cover the quality ones in the post. Here are some things you should consider before buying an aftershave. Before we begin, it is important to point out that scent is a very small consideration when shopping for the aftershave that best suits you. After all, you can get a great scent from a cheap cologne. Sure, consider an aftershave’s scent before buying one but it isn’t the primary thing you should consider. Here are four things to consider before buying an aftershave. Balm aftershaves work if you have dry skin or live in a cold or dry climate. They are also the best type to use if you are just starting to use aftershaves. If you have oily skin, you can go for splash, lotion or gel aftershaves. Men with sensitive skin don’t really have to decide on types of aftershaves. They need to go for an aftershave that is paraben-free and contains no alcohol which can burn the skin. The two main ingredients you should look for in any aftershave are witch hazel and alcohol. Witch hazel is a natural astringent for our pores and is the key ingredient in many beauty products. In an aftershave, it constricts your pores without drying out your skin. It also has anti-inflammatory properties that help soothe irritated skin which is why you may find it in bug bite and rash treatments. Witch hazel also cleans the skin as it flushes out bacteria, as well as the bacteria that causes acne.Alcohol has been used to scrub skin for a long time. However, it can aggravate irritated skin and sting when you apply it to your face. It also dries out skin. So witch hazel is the better ingredient in an aftershave. There are other natural ingredients, besides witch hazel that you should look for when buying an aftershave. Ingredients like aloe vera, tea tree oil and humectants are great for the skin. Aloe Vera has soothing properties. It helps heal burned skin and also reduces pain so it works wonders when applied to irritated skin after a shave. Tea tree oil is a natural antiseptic that cleans out the pores to prevent skin infections. When mixed with witch hazel, it can greatly soothe your face after a shave. Humectants like glycerin, lactic acid and sorbitol are often found in aftershaves as they help reduce the dehydration issues caused by the other active ingredients. Scent is a part of the purchasing decision although it shouldn’t be a primary factor. In weighing the fragrance factor, you should look at the fragrance duration and the types of fragrances that are used. How long a fragrance lasts depends on several factors like body chemistry and skin type. Oils are the primary ingredients in fragrances and will wear off quickly when applied to dry skin—a fragrance will last longer when applied to oily skin. Alcohol also affects the duration of a fragrance as it evaporates quickly. So if an aftershave has less fragrance plus alcohol, the scent will fade faster. In regards to the types of fragrance, the primary fragrance used in aftershaves are citrus, oriental, floral and woody scents. Quality fragrances are multi-layered to appeal to your sense of smell in all three stages: top, middle and base. The top layer is what you smell when you first open the bottle and lasts the least amount of time. The middle layer is what makes up the bulk of the fragrance. The base layer forms when the top layer evaporates and combines with the middle layer to prolong the scent. Alright, let’s get to it. Here are the best aftershaves for men. 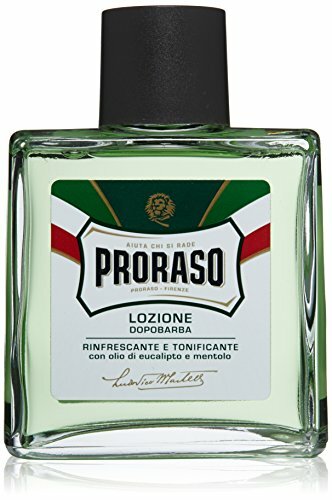 Proraso aftershave lotion really takes you back to those times when a shave was something every man looked forward to after walking into a barber shop. That hot towel to soften the beard, followed by a super-close shave with a quality razor and then that splash of fragrant, refreshing aftershave. That’s the experience Proraso has been delivering since 1948 and is the reason why it’s one of Italy’s most iconic brand names. Their aftershave lotion is made of fresh natural ingredients like eucalyptus oil (which tones and purifies your skin), menthol (which refreshes and revitalizes) and witch hazel (which reduces rashes and razor burns). It has a clean, mild smell that doesn’t linger all day long. People have complained that it smells quite medicinal but it will fade within a couple of hours and blends well with cologne. Although the lotion feels great and leaves your skin soft, it may not cool and refresh your face that well if you have any irritation from shaving. That is because it is not made to provide the same cooling effect that their pre-shave lotion does. 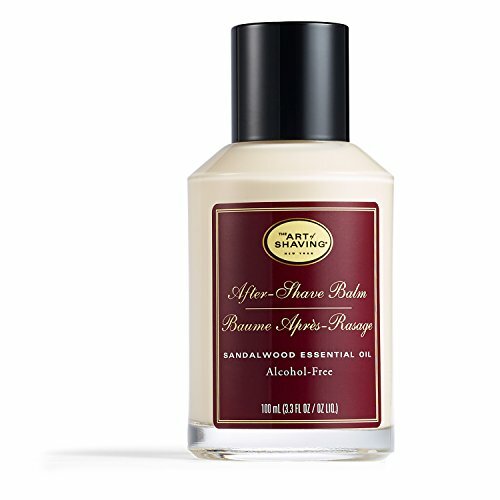 The Art of Shaving aftershave balm replenishes moisture on your skin to help soothe dry skin after a shave and simultaneously revitalizes and conditions your skin. Among the list of ingredients are shea butter and grape seed extract which nourish the skin. It is alcohol-free which means no burn and also has antiseptic properties. The scent is based off 100% pure essential oils which is why all their products are known for their therapeutic skin properties and suited for a variety of skin types. The sandalwood scent in particular has a woody undertone that provides a calming aroma. However, if you are expecting a lot of fragrance, you may be disappointed. The fragrance doesn’t linger and isn’t strong enough. Some people say that they changed the formula so that may be why the scent is weaker. It’s ideal for men with sensitive skin because it is free of parabens and sulfates. 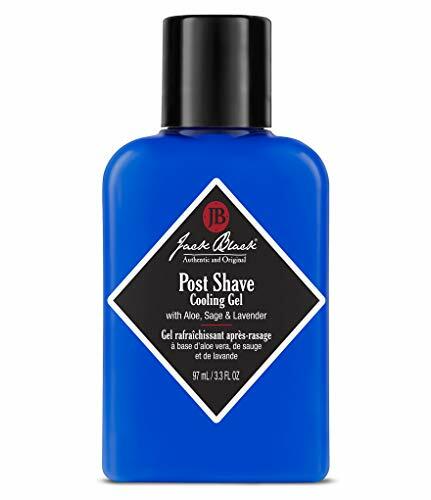 Jack Black’s post shave cooling gel is an alcohol-free soothing lotion that adequately fights razor burn, redness and irritation from shaving. It also doesn’t sting your face like other aftershaves. The gel has cooling properties which close your pores after a shave. It has aloe extracts which help to further help treat irritated skin. The chamomile and witch hazel also help to soothe your face after a shave. The sage helps to take care of blood circulation to your hair follicles, promoting healthy hair growth. The lavender acts as an antiseptic to help heal your skin after an intense shave. Although it is cool and soothing, it may not help to do away with the redness of a razor burn. Some people have complained of stickiness regardless of how much or how little they use the product. It may not dry or absorb into your skin as much as you’d like it to so it could sit on the surface of your skin for a while. If you like fragrance, stay away from this product as it’s fragrance free. It is best for those with super sensitive skin as it is also paraben and colorant free. A little goes a long way with this cooling gel. 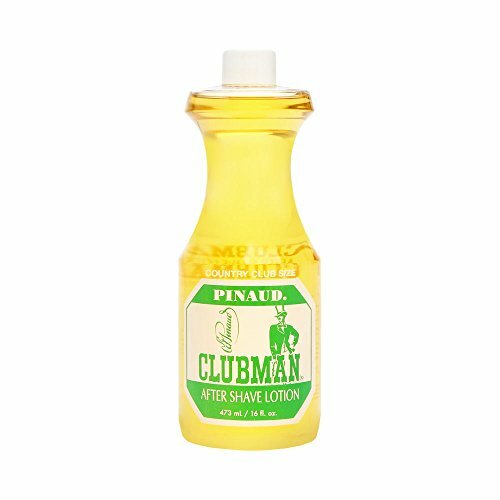 Clubman Pinaud is an American brand with French roots that has been in the grooming business since the 1920s. Although their shave lotion is a liquid aftershave, it glides on like lotion, leaving a smooth, moisturizing effect. The cooling sensation takes immediate effect and relieves razor burns quite fast. After a couple of hours of applying it, you will smell a pleasant orange and lemon aroma that help to keep you refreshed throughout the day. If you have really sensitive skin or prefer products with only natural and organic ingredients, this aftershave may not work for you. It has quite a bit of alcohol and perfume which could irritate sensitive skin. 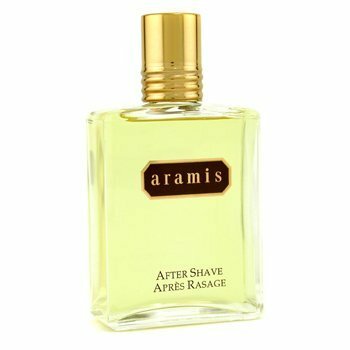 Aramis aftershave splash for men comes in a sleek and stylish bottle. To apply it, you simply pour it onto the ends of your fingers and splash it over your skin. The floral, spicy aroma with a hint of sandalwood and fresh leather will last the entire day and evening. The product of not one that is all-natural but it has a quality fragrance that is quite bold and lasting. That said, it is not ideal for those with sensitive skin. Use it as a toner and astringent as it sanitizes any cuts and fights bacteria while keeping acne and spots at bay. It also helps to refresh your skin instantly after a shave. That’s the round up of the 5 best aftershaves for men. We hope you can find the perfect aftershave for you from this list. Know of a good one we haven’t covered? Let us know in the comments. Want to learn more product reviews? Check out these other helpful guides!